The fully responsive, retina optimized Response Theme is our latest and greatest WordPress theme. View the demo on any device to see the theme in action. Scale your browser to see the responsive framework take effect. The Response Theme marks the beginning of a new era for Organic Themes. We have taken extra time and care to create this theme from the ground up with several new features, while still maintaining our easily understood code base. This theme is a dream for designers and developers. New features are overflowing within the Response Theme. Several shortcodes are available for easily displaying beautiful buttons, icons, tabs, headlines, toggles, modal boxes, galleries and much more within any page or post. The theme contains options for changing colors, site width, social media options and more. There are several background options for posts displayed in the featured slideshow. The Response Theme contains post formats for a variety of blog posting options. In addition, the theme is WooCommerce compatible for selling online products. 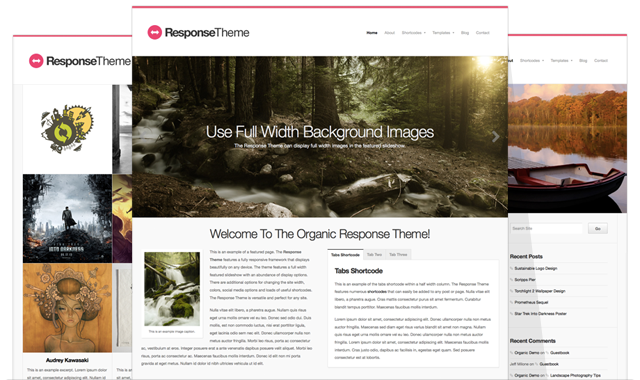 The Response Theme is an excellent solution for any storefront, business, portfolio or blog. Its extreme versatility will adapt to your brand with ease. We hope you enjoy the latest addition to our theme collection. Happy New Year from Organic Themes! Had a tragic loss of database and as such, have got to re-install my business website from scratch, with only XML files saved! This gave me the excuse to look at a completely new site. I’ve been using the News theme but the response Theme is just beautiful so I’m gonna re-work the site to use that funky new theme from those great folks at Organic Themes. Thanks to you all for such lovely themes – you blow the competition away! A great job. theme is very simple. Is there something particular I don’t understand here or is my zip archive uncomplete? Yes, thats rigt. Response Theme features displays beautifully on any device. Grat job. Thanks. Is this theme still being supported? I need some assistance updating it to the current version of WP. The theme has been retired a few months ago now, but if you still have an active support subscription send us an email and we can look deeper into any issues to see if it’s something we can fix for you.